SharePoint is steadily gaining increased rate of acceptance among organizations as their primary document management platform. A survey conducted by AIIM in early 2016 revealed that 28% of the major organizations are already using it, while more are testing the waters before taking the plunge. Team Collabion did some research and put together a list of best practices that can help an organization manage documents better with SharePoint. SharePoint offers a lot of features for managing documents, from alerts, content types, and document libraries to meta tagging, version control and check out. For best results, admins need to decide how to train every employee on proper usage of these features, before letting them use SharePoint. Setting up different views can also help users find and access documents quickly. SharePoint can support an unlimited number of document libraries with different permission sets. This offers admins with the option to set up different libraries, as well as decide which documents should be universally accessible and which ones need to be secured against any sort of unauthorized access. Document libraries also allow admins to set up alerts that automatically inform creators of documents whenever someone tries to modify or delete their content, thereby increasing security. Using folders in SharePoint may be necessary in some circumstances, but nothing makes documents more easily searchable than meta tags. These tags also make it easy to segregate documents based on the type of content they have. Training users on the proper ways to input the tags, as well as defining conventions that everyone need to follow may take some time. However, it is worth it, considering how much it can simplify document management for admins in the long run. Not all organizations may need this feature, but it is good to have it enabled if multiple users need to work on the same documents on a frequent basis. That way, when one of the users is editing a document, other users will only be able to view it. They will be able to edit it only when the document is closed and ready for check out, and the creator/admin grants them editing permission. That way, there is no risk of the sections edited by one collaborator getting accidentally overwritten by someone else working on the same document. Version control lets admins to quickly identify team members who edited a document, as well as track the changes that they made. It also lets admins quickly revert to an earlier version with just a click. One drawback of this is that every version is essentially the entire document, and not just an incremental update. As such, admins need to decide how many of the previous versions they want to preserve, so that they don’t end up exhausting available disk space. 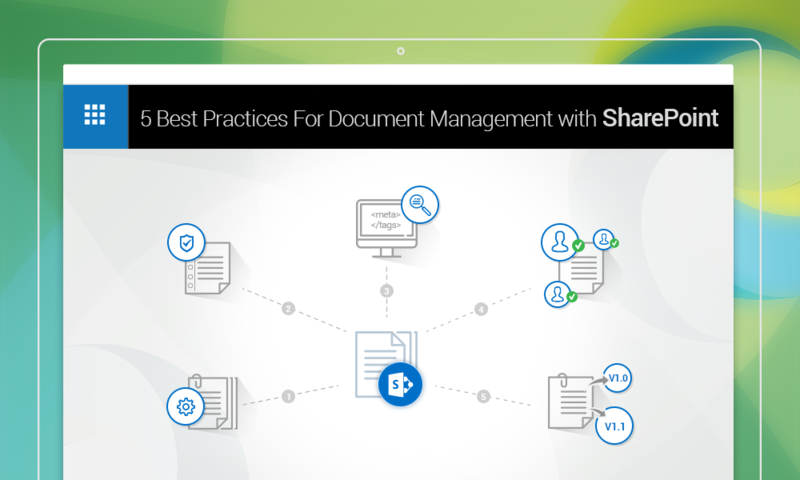 These 5 best practices can help organizations get the most out of document management in Microsoft SharePoint, ensuring security for content and maintaining accessibility for authorized users.